Chinese people love snakes. They also love to eat them. 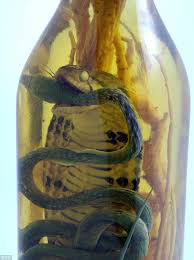 Chinese believe in traditional Chinese Medicine and faithfully drink expensive wines that feature snakes--carefully preserved in each bottle. Eating the preserved snakes is considered a "delicacy." Leading restaurants in Beijing, China, offer a variety of snakes as the main course. These expensive and popular restaurants feature elaborate aquariums showcasing live snakes so Diners can choose the very one they want to eat. If diners don't want snake, they can choose their main course from a variety of live fish, turtles, eel, squid, octopus, and other sea creatures. Dining with friends in one of Beijing’s more popular eating spots, I overheard the family at the next table order snake. Imagine my shock when the waitress walked past our table, expertly dragging two very- large and very-active snakes. After carefully examining the snakes on display, the Chinese family selected their dinner. Today's modern Chinese prefer to choose their main course while it’s still alive. Only when their selections have been expertly killed and cooked at their table, do Chinese people feel they’ve enjoyed-- first hand-- the freshest and the finest meal-- money can buy. Chinese believe snakes represent power. Most traditional Chinese, especially those in rural areas, kill a snake to drink its blood. Chinese Medicine promotes snake blood as the ultimate source of healing. It was a scary day when I saw my first bottle of Chinese wine with a snake inside. Desperate for some American food items, I visited a new Chinese grocery store, hoping to find something representing "home sweet home." Searching for edibles that looked familiar, I turned down a small aisle and came eye-to-eye with bottles filled with wine and...snakes--classically coiled and "ready to strike." It was my first encounter with China's famous snakes in wine bottles. The Chinese people have-long-believed that snakes contain valuable medicinal properties. They consider snakes as the secret to longer life. For those who can't afford the more-costly wines with snakes, there are wines surrounding lizards, frogs, scorpions, spiders, earthworms, and snake heads. The label on each wine bottle explains the attributes of first---drinking all the wine then--- breaking the bottle to eat the “main attraction.” Chinese view many reptiles, animals, and insects, as valuable resources for good health and long life. Chinese often purchase these expensive and unique bottles of wine for their foreign guests. While living in China, I was the recepient of many gifts, including more than thirty bottles of wine with snakes but.... I couldn't bring myself to touch, let-alone open... even one bottle of Wine. I gratefully accepted each sincere gesture to wish me good health and a long life but... the gifts of wine made sleeping...impossible.. Even though I hid each beautifully-boxed wine bottle..out of sight... under my bed, I remained horrified just-knowing snakes were encased in each bottle and "living" in my room. After too-many tormented and sleepless nights, I finally hit-on a solution: I invited the Hotel's laundry room employees (those paid the lowest wages) to visit my room and gifted each one with a valuable snake-filled wine bottle. As traditionally-loyal Chinese, they were excited to receive something they could never afford. Yes, Chinese Medicine believes strongly that reptiles-pickled-in-wines can cure a long list of ailments including heart trouble, headaches, even a vanishing libido. SO....just how-far would you go to improve any or all of your health issues?!?! ?